Greater comfort and security. Lower energy bills. Lower maintenance. A home that’s healthier to live in and easier on the environment. That home is made from concrete. Insulating Concrete Forms (ICFs) provide all the benefits that have made concrete the material of choice for home building worldwide: Solid, lasting construction that resists the ravages of fire, wind, and time. But ICF’s do plain concrete one better – or rather, two better – by offering two built-in layers of foam insulation. This gives an ICF home some sizable advantages over an ordinary stick-built home. The ICF home provides greater energy efficiency, more peace and quiet, and more day-to-day living comfort. 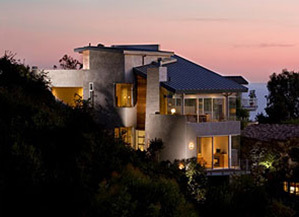 Building a concrete home with insulating concrete forms (ICFs) saves energy and money. The greater insulation, tighter construction and temperature-moderating mass of the walls conserve heating and cooling energy much better than conventional wood-frame walls. This reduces monthly fuel bills. It also allows use of smaller heating and cooling equipment, saving money in construction. How much will I save? Houses built with ICF exterior walls require an estimated 44% less energy to heat and 32% less energy to cool than comparable frame houses. A typical 2,000 square foot home in the center of the U.S. will save approximately $200 in heating costs each year and $65 in air conditioning each year. The energy savings estimates are from a study of 58 single-family houses across the US and Canada. Half had exterior walls constructed with concrete using ICFs made of expanded polystyrene (EPS) or extruded polystyrene (XPS) foam. The other half were neighboring houses with wood-frame walls. All houses were less than 6 years old. 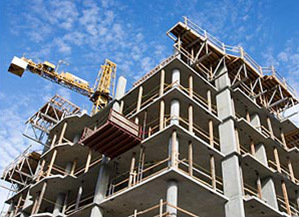 A major advantage of concrete construction for high-rise buildings is the material’s inherent properties of heaviness and mass, which create lateral stiffness, or resistance to horizontal movement. Occupants of concrete towers are less able to perceive building motion than occupants of comparable tall buildings with non-concrete structural systems. As a result, concrete has become the material of choice for many tall, slim towers, including many squeezed into narrow building lots in New York City in recent years. Engineers deemed concrete to be the only viable structural option for the structures—including City Spire on West 56th Street, with its slenderness ratio of 10 to 1—to withstand anticipated wind loading. Continued improvement in concrete strength in the past decade has been a major factor in the development of taller buildings in the United States and throughout the world. New structural systems—including high-strength concrete—created either from concrete alone or with a composite system that includes both concrete and structural steel are partly responsible. These systems enable skyscrapers to resist the enormous wind and earthquake loads imposed along their height and allow these structures to support the vertical loads created by gravity, the weight of the building, and its occupants. In the last few years the public has been quick to appreciate the concept and advantages of quality, high-rise residential buildings in the inner city. For many designers and contractors, pre-cast concrete is the obvious choice for cladding; it has solidity and strength, factors that recall traditional residential enclosure, yet it has all the advantages of a modern prefabricated product. Pre-cast cladding panels can be shaped to form mullions and spandrels or storey-height panels and windows. Other components can also be pre-fitted at the pre-cast factory. For top performance and value in commercial building under all types of challenging conditions, you can’t beat concrete. Concrete buildings resist fire, withstand the high winds of tornadoes and hurricanes, and take earthquakes in stride, providing maximum safety, security and comfort for the people in them. Concrete buildings also provide remarkable flexibility in design, exceptional aesthetic possibilities, strong environmental support, rapid construction and are the most economical for owners over time. Two concrete building technologies in use for decades are now finding broad adoption across North America. Tilt-up concrete and Insulating Concrete Forms have in common the basic concrete advantages noted above but each also has specific benefits addressing varying commercial building requirements. 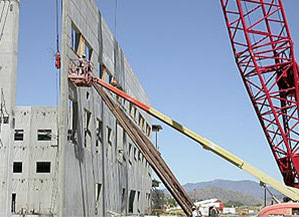 According to Ed Sauter, Executive Director of the Tilt-Up Concrete Association, “tilt-up construction continues to gain market share for several reasons: speed of construction, advances in architectural treatments, and adaptability to markets such as schools, retail centers and office buildings.” There has been a 111% growth in tilt-up construction since 1995. Nationwide, over 15% of all industrial buildings are tilt-up, ranging in size from 5,000 to over 1.5 million square-feet. They are typified by their attractiveness, efficiency and longevity. To find out more about tilt-up construction, log on to www.tilt-up.org. Concrete is the superior paving material for your parking area project. Whether a new parking area or one in need of reconstruction, concrete offers the durability and beauty that asphalt cannot match. Durability– Concrete simply lasts longer than asphalt. A concrete parking area can serve your project for twenty or more years. The durability advantage means less maintenance, fewer repairs and an end to the expensive reconstruction cycle. Pave it once, pave it right. If you have an interest in the life-cycle costs of a project beyond tomorrow, then concrete is the easy choice. Beauty– Concrete’s durability means a surface free of ugly potholes, ruts and damage from petroleum products. 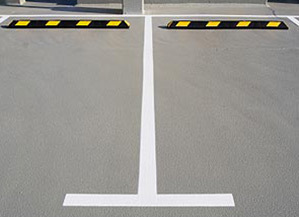 Add some colors, a pattern, and concrete turns a parking lot into the perfect showcase for your business. Safety and Lighting – Concrete offers a brighter, more reflective surface than asphalt. Better use of light means a safer and more inviting parking area for your customers and employees. Loading Carry Capacity– Trucks demand a structural pavement. Asphalt is no match for eighteen wheelers and delivery vehicles. 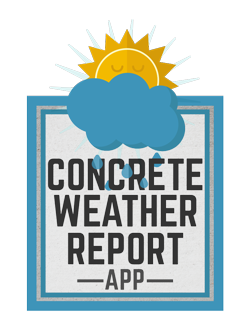 If product distribution is mission-critical to your project, then concrete is your paving partner. With mounting stress on our transportation infrastructure, construction of concrete highways is a proven long-term infrastructure investment. The United States already recognizes the benefits of a concrete infrastructure and has incorporated concrete pavement into over 30% of its interstate highways. Concrete provides not only economic and environmental benefits, but also direct user benefits that offer a sustainable solution to infrastructure challenges. One of the most well known advantages of concrete is its superior durability and longer structural life. This durability translates into less road delays due to construction and maintenance. A 1998 life cycle cost report by ERES Consultants Inc. indicates that the expected life of an asphalt road is 17 years compared to 34 years for concrete. The report also indicates that asphalt highways require maintenance activities every three to five years and major rehabilitation becomes more and more frequent after the initial 17th year overlay. Concrete on the other hand, requires its first minor maintenance after 12 years and retexturing of the concrete surface at year 18, allowing roadway users to get to their destination with fewer delays. Concrete pavement is a rigid structure and asphalt is a flexible structure. 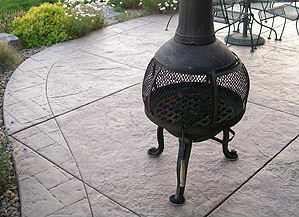 Historically, pavements have been divided into two broad categories, rigid and flexible. These traditional definitions, in some cases, are an over-simplification. However, the terms rigid and flexible provide a good description of how the pavements react to traffic loads and the environment. Flexible asphalt pavement generally consists of a surface of asphalt built over a base course and sub-base course. Base and sub-base courses are usually gravel or stone. These layers rest upon a compacted sub-grade (compacted soil). In contrast, rigid highway pavements are made up of portland cement concrete and have only a base course between the pavement and sub-grade using approximately half as much granular material. By virtue of its rigidity and stiffness, concrete pavements tend to distribute the load over a relatively wide area of sub-grade. 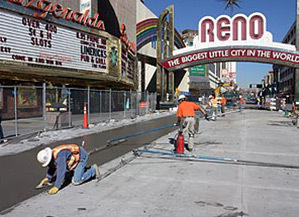 The concrete slab itself supplies a major portion of a rigid pavement’s structural capacity. Flexible pavement, inherently built with weaker and less stiff material, does not spread loads as well as concrete. Therefore flexible pavements usually require more layers and greater thickness for optimally transmitting load to the sub-grade.